Very convenient to pick up at airport before departing and the card can be used immediately upon arrival. Make your trip to Singapore hassle free with convenient cashless payments using the NETS FlashPay Card! This Singapore public transportation card is one of the most versatile stored value electronic cards in the country, and other than public transportation, you can also use this card to make payments at food courts, convenience stores, and even selected hawker centers too. Pick up your NETS FlashPay Card from the available pick up locations or have it mailed to your doorsteps with your choice of pre-loaded value so you could skip the long lines at train stations. 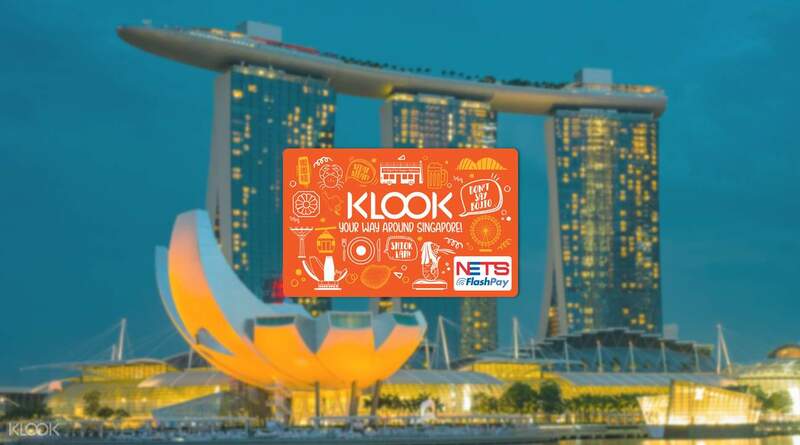 Have the perfect souvenir from Singapore with the limited edition Klook design NETS FlashPay Cards decorated with famous Singapore icons. Most blogs recommend to buy mrt card in the airport but i prefer this. Not only that it is stylish but can also serve as your souvenir in SG. You even get a 7SGD stored value. I am from The Philippines so i would suggest to buy this in advance and have it mailed to your address. Picking this up in the Klook office can be a hassle. Keep it up Klook! Most blogs recommend to buy mrt card in the airport but i prefer this. Not only that it is stylish but can also serve as your souvenir in SG. You even get a 7SGD stored value. I am from The Philippines so i would suggest to buy this in advance and have it mailed to your address. Picking this up in the Klook office can be a hassle. Keep it up Klook! Redeem at Klook Office near Clarke Quay Mrt Station. Staff very kind. Nice card and convenient. Redeem at Klook Office near Clarke Quay Mrt Station. Staff very kind. Nice card and convenient. I was able to receive it 3 days after ordering through mail delivery. Going to different places within SG was a breeze. You just tap the card to enter the train and bus. It can also be used to pay in 7-11 stores. I was able to receive it 3 days after ordering through mail delivery. Going to different places within SG was a breeze. You just tap the card to enter the train and bus. It can also be used to pay in 7-11 stores. The centre is close to Clarke Quay MRT and good to walk around and have a drink after. Staff is nice snd I bought the card on the spot. The centre is close to Clarke Quay MRT and good to walk around and have a drink after. Staff is nice snd I bought the card on the spot. The card shipping to Indonesia is so fast,only 2 day and the packaging is also so safe.The price is also cheap and can directly use when I Arrive at Changi Airport and take MRT to the city.The information card on the package is also full of important information and useful. The card shipping to Indonesia is so fast,only 2 day and the packaging is also so safe.The price is also cheap and can directly use when I Arrive at Changi Airport and take MRT to the city.The information card on the package is also full of important information and useful.